After a tumultuous winter we were ready for what would end up being our annual dose of unseasonably warm weather before plunging back into the cold. The boys ended up using the cold days to work on their songwriting in the play room. Elliott seems to be exhibiting the characteristics of a traditional drummer in that he is most comfortable playing with as little clothing on as possible. Elliott recently discovered an intense love of arugula which caught both of his parents off guard. For a couple of weeks I could barely keep enough on hand, causing me to have to run out to nearby stores in an attempt to find acceptable greens during one of the worst seasons California has had in recent memory. I did not think that running out of arugula would be the thing I was most worried about sending my kids over the edge. Arugula was playing with a string that we hung from doorway to hang Christmas ornaments and ended up giving himself this horrific rope burn. Martin, on the other hand, got clawed by this brother during a wrestling match where Elliott pretended to be a lynx. You can probably guess from looking at these two injuries that we were mere days away from picture day at school. Martin's obsession with Wild Kratts only continues to deepen and he draws at least two or three new pieces of Wild Kratts inspired artwork per day. 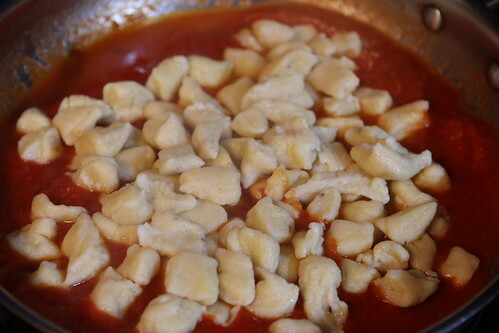 Elliott helped Jen make a big batch of gnocchi while Martin watched Wild Kratts and, of course, the huge batch only ended up being enough to get us through most of one meal. The skating routine has been going very well. Elliott tends to follow the teacher's direction really well. Martin tends to spend most of the class talking the teachers' ear off. They're both doing well but Martin could probably be further ahead if he spent less time talking to the teacher about Wild Kratts. With the warmer weather Martin has figured out that he can just walk over to our neighbors' house any time he feels like it to chat with them. On the day of the neighborhood Easter egg hunt I kept losing track of him only to find he'd gone next door, rung their doorbell, and was asking them about something or another. They were extremely eager to get to the egg hunt after we pried Martin away from our neighbors. Martin was a little upset that he only got one egg. He found a lot but in his exuberance he lost quite a few as he swung basket around as he ran. Elliott showed mercy on him and shared some of his chocolate. When we got back Martin escaped again and came back in asking if he could have our neighbor, Mr. Tim's, fox tail. I told him no then he explained that he'd been over Mr. Tim's house and Mr. Tim told him to ask me if it was okay. We went over and, needless to say, we are now the proud owners of a fox tail. For Passover I made matzoh crunch for the kids which was a big hit. They also enjoyed eating crackers the size of their heads. Nana and Grandpa showed up with plenty of activities to entertain the kids who were very excited to see them. Grandpa even made lunch for the kids, something that happens pretty infrequently. I'm not sure they were 100% ready for fluffernutters but I certainly was. Easter morning saw a fun hunt through the house and yard. Josie slept extra long so we held the boys off with videos until she woke up. This eventually lead to a bit of a tantrum but we were able to avoid a complete meltdown and salvage most of the morning. After finding all his Eggs, Elliott reached deep into the backpack he'd packed for hunting, removed Mjölnir, and started cracking them open in a precise and practiced way. The best gift they got was these eggs that you put in water and let them hatch slowly over the course of a few days. They couldn't get enough of them, checking them every twenty minutes an noting their progress. Apparently my parents got these as an after thought but they were a huge hit. 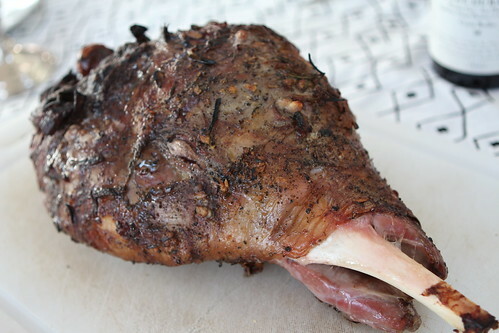 After a two year hiatus I busted out the spit and did the lamb over an open fire once again. This was probably the best lamb I've ever cooked or eaten in my life. There's something extremely satisfying when you blindly stumble into cooking something so good that you can't even believe you did it. It was so warm the week after Easter that we ended up grilling and having dinner on the deck most nights. After a long winter there is really not much better than eating out on the deck. Not only is it beautiful to eat outside but it's so nice to let the kids make as big a mess as they'd like and not have to worry about cleanup. For Josie's birthday we took her to a nearby indoor play area with her brothers and our friends, the Farmers, who were visiting from New Jersey. She had a blast and came home to take an epic multiple hour nap. While she napped we took the big kids to the park. Some of the big kids even enjoyed a quiet snooze on the couch after the fun-filled afternoon. For Josie's birthday her brothers got her a school bus. It was the first present she got and had it ended there she would have been completely happy. Of course it didn't end there because even though logic tells you not to shower a two-year-old with gifts, most people cannot help themselves and we all ended up getting her way more than she needed or wanted. Overall Josie had a great birthday weekend, a great party, and had a ton of fun with family and friends. The next day the boys and Jen got ready to go see cousin Evelyn at her dance recital and brought her some special flowers. The next day Nana and Grandpa had to leave so we all said our goodbyes before the boys went to school and Nana and Grandpa hit the road. Later that day the boys came home from school and we hung out with Auntie Lisa before she returned home and enjoyed the last day of beautiful weather before we returned to chilly, rainy days. It was a good close out to April and a great Easter and birthday party for Josie. In a couple of years her birthday will be on Easter itself and that should add a new element of fun to the overall weekend. For now the events remain separate as we try to figure out how this little baby became a two-year-old seemingly overnight.